In partnership with the Education International, a global union federation of 396 associations and unions in 171 countries and territories, representing some 32.5 million educators and support professionals, and Justice for Colombia, a British NGO that campaigns for human rights, workers' rights and the search for peace with social justice in Colombia. JFC was established in 2002 by the British trade union movement. 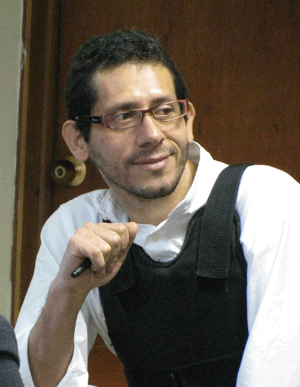 Dr Miguel Ángel Beltrán, a Colombian academic and member of the higher education union ASPU, was arrested on charges of rebellion in July 2015 and unjustly sentenced to 8 years' imprisonment in a high security prison in Bogota. Dr Beltrán was recently on a hunger strike to demand a fair review of his case, and the improvement of detention conditions for all prisoners in general. Dr Beltrán is an outspoken critic of the Colombian government and has dedicated much of his research to conflict and turmoil within the country. Colombia has one of the highest rates of violence against teachers and trade unionists. Dr Beltrán was first arrested in May 2009 on charges of rebellion and conspiracy. Despite being cleared of all charges in 2011, he was removed from his position at the National University of Colombia and still suffers a politically-motivated ban preventing him from serving at any public universities in Colombia. Education International (EI) calls on you to urge the government and judicial authorities of the Republic of Colombia to urgently review the judicial case against Dr Miguel Ángel Beltrán, professor at the National University of Colombia, and to authorise his immediate release. Education International has made a formal request for his case to be reviewed, for his release and for the restitution of his civil and academic rights.